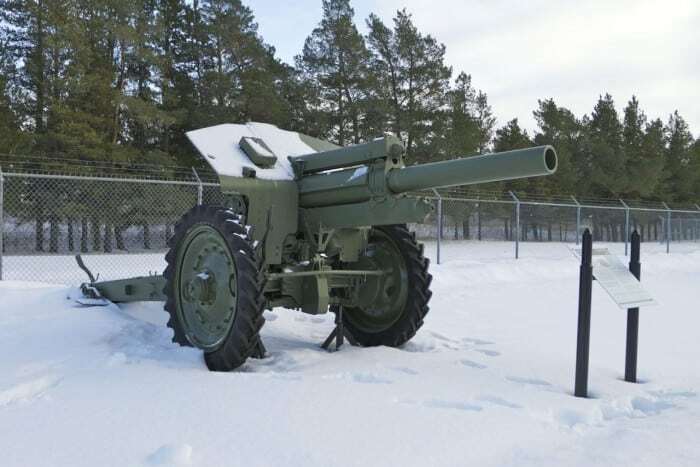 Used by the Red Army during World War II, the 122mm M1938 Howitzer was widely used by the Soviet Union and its allies during the Cold War. The 122mm M1938 Howitzer was introduced into the Red Army in September 1939. It was the standard Soviet divisional towed howitzer into the 1960’s. Captured examples were used by the German and Finnish Armies during World War II. This gun was also produced in China as the type 54. Unusually, it is possible to fire without opening the trails, although traverse is extremely restricted. The gun on display was made in Czechoslavakia after World War II.